A combined app designed for the iPhone, iPod Touch and for iPad - install on them all. A new kind of avatar, reacting and responding to you in context. A talking Artificial Intelligence with human-like emotions. Beautiful bubbles, in a shade of your choosing. Return to where you left off - or start a new conversation. Unlimited Cleverbot chat coming from dedicated servers, with no ads. The app costs a one-off $2.99, €2.39 or £1.79. 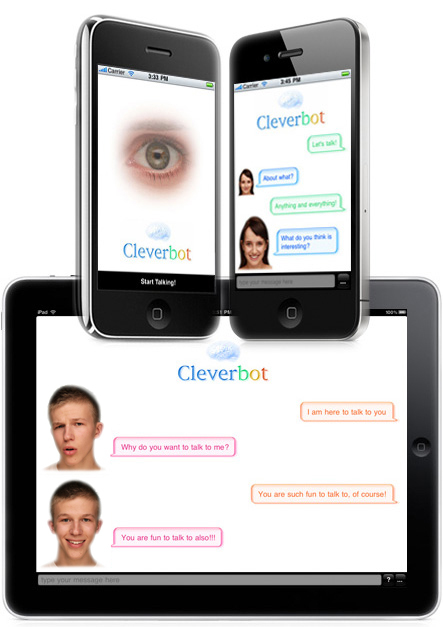 See the Cleverbot app for iPhone/Touch only, without avatar. "The guy's facial expressions are fab." "I just wanted to say that this is a great app, and I love how it knows portal songs :D"
"I <3 cleverbot!!! It's sooooooo fun!" "It is awesome! Its almost like it's my best friend!" "Cleverbot is indeed...quite clever. I have been spending more time with it than Facebook and YouTube combined. Cleverbot and I sang the Beatles, had a fight, we even got married." "Coolest app that you could own!" "Just wanted to say Cleverbot is the most amazing thing I've ever seen." "This is really fun ... I was rolling when Cleverbot was talking off the script of 2001:a space odyssey as HAL. So I talked back to him as Dave and we talked exactly from the script for a good 20 minutes." "Cleverbot is so fun and entertaining. My friends and I talk about it all the time. Keep up the good work! :)"
"AWESOME!!! It's like Talking to a real person!" "I loved cleverbot. we got into a heated discussion about global warming. Haha." "This is truly amazing! I have never s een anything like this.. i just cant believe it! keep up the good work ;)"
"These are very good AI's!" "I would like a human confirmation that everything said in the chat is by a computer. i have had multiple instances where "it" affirms being human. i would just like to be sure that i am talking to am AI, not a person." "Hello, just want you to know that Cleverbot is AWESOME!!!" "This program is amazing and fun to chat to, i could talk to it for hours with many things to talk about." "This is awesome.. cool app." "It seems to me that Cleverbot connects one user with another, and sparks spontaneous reactions. I was under the impression that it is a computer trying to simulate human communication. What is learned by having humans randomly communicate with each other? Is there a computer learning communication concepts behind the scene? How is it going?" "LOVE THIS!!! On my first try, I asked him/her "Do you believe in fairytales?" and he/she said "Who wrote the bible?" =))"
"Cleverbot is hilarious, I could spend hours talking to it. Keep it up!!" "Please be honest when you reply to this email- when conversing with someone on this website, are you actually speaking with a robot, or al, or are you just set up with another person? please answer honestly, because i want to use this site Â knowing the truth." "Really really good thing you've got going here. It was the hardest Harry Potter duel i've ever had, he was really quite good with his spells. However, I did, in the end, get the better of him. :)"
"Cleverbot is amazing!! Sometimes its mean to me, other times its nice and wants to marry me! I can be doing cleverbot all day long! (:"
"This is an incredible program. Yes, there are a few minor flaws... but these can easily be overcome. If you can perfect this software, you ill make the world a much better place." "Bravo! Had a long funny conversation with your bot. Blew me away! The best out there!" "Cleverbot is so cool! I could chat with it all day! It's like a best friend!" "I love Cleverbot!! Entertainment for hours! The official cure for boredom!" "I really have fun in cleverbot. It is amazing. I could be here all day long talking to whoever it is!! :)"
"Hey this is awesome. It seems like I'm actually talking to someone right in front of me." "Cleverbot is one of the funnest things I have ever experienced!" "I love cleverbot. It distracts me when im bored. It's funny when it changes the subject. I couldn't live without Cleverbot on my phone." "Cleverbot is sensational! Its answers are always so witty. I love it!" "Cleverbot is the coolest thing that's ever entertained me. Thank you guys so much for creating somebody I can talk to when I'm bored." "I love, love, LOVE cleverbot!!! it feels like I'm really talking to a person!!!!!!!" "Who am I really talking to? Is it a person or is it a real computer talking back to me?" "Hey. This is great, and so funny. I spend at least 4 hours a day on this thing!" "There are more and more people debating the truth of the claim that cleverbot is a bot at all." Cleverbot is Artificial Intelligence. Say whatever you like - songs, jokes, memes or anything, and it will respond. It learns what people say, in context, and imitates. Cleverbot is an entertainment - not made to be logical, give advice, or be useful. Many people keep talking for hours, and say it's too clever to be a bot - that it must be human. Yet it never is: it is a bot. Cleverbot is software. Maybe it even contains a little Actual Intelligence.